I usually make whole berry cranberry sauce with chopped walnuts and celery for Thanksgiving, but I admit this spicy Cranberry Fiesta Salsa from Ocean Spray would be just as good and maybe better. I might add celery and walnuts, but neither the spicy, sweet taste or the chopped berry, apple and tomato texture require tweaking. If you would rather make your own fresh cranberry salsa, I found a recipe from Ocean Spray. The "home-made" recipe doesn't have apples or tomatoes, so I'm guessing the sugar content of the "home-made" would be higher than the "store-bought", because the "store bought" would benefit from the sweetness of the apples and tomatoes. I paid $5.39 for a 40 oz. jar at Costco. According to the nutritional label, a serving of two tablespoons has 40 calories. 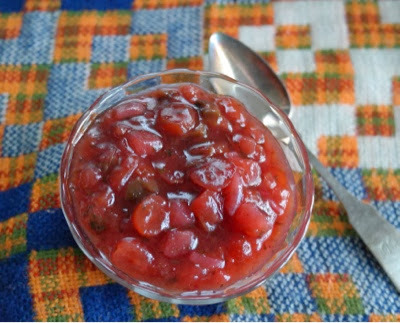 The cranberry salsa goes well with chicken and salmon; reminiscent of the Costco Mango Salsa, it has a similar bite. For most times of the year, I would prefer the Costco Mango Salsa; but, for November, the cranberry salsa seems fun and festive. In researching this, I discovered some customers are very mad at Ocean Spray for using genetically modified sweeteners (GMO). Ocean Spray seems to use them only in some beverages. GMO's are not an issue in the fiesta salsa, as far as I know, but if you are boycotting any company that buys GMO, then you won't want to purchase from Ocean Spray.